We also offer an Edinburgh for Under Fives book, for £9.95. We know getting out and about with a young baby isn’t always easy. At the same time we think that meeting other mums and dads is vital for our sanity! That’s where Buggy Walks can help. 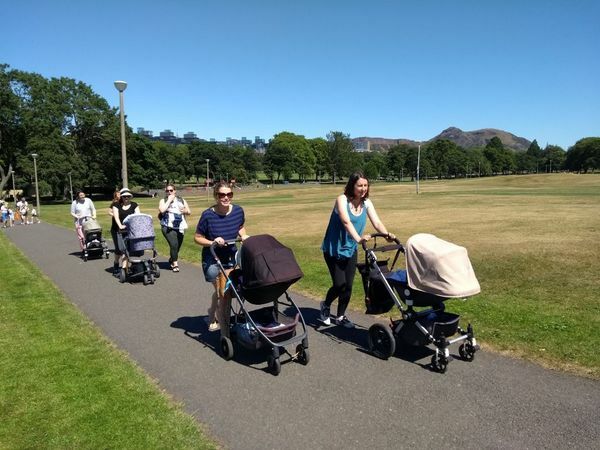 They organise FREE, fun and informal walks that are suitable for buggies and slings all over the city, from Holyrood Park to the Botanics. There are walks every weekday and weekend, and most end up in a cafe for a chat and a cuppa. Looking for a gentle fitness class where you can bring baby along either in the buggy or on a sling? Look no further. As a mum-of-three, Jenni McMaster McLachlan knows how tricky it can be to get that perfect shot of little ones. Now the Edinburgh-based family photographer shares her secrets to taking great snaps of children. Stay calm, clown around - and watch out for blue tongues! Tara McGregor is passionate about yoga for young children. We met her over a coffee in Bruntsfield to ask her all about Tatty Bumpkin, a creative and engaging yoga inspired class which involves storytelling and music. This year Fenton Barns Nursery near North Berwick celebrated its 5th birthday with a cake made from ingredients grown in the nursery garden. Its very first intake of babies are now off on their next adventure at school, so it was only fitting to mark the occasion by embracing its emphasis on healthy eating and local food. With over ninety different baby and toddler groups across the city, it’s very easy to feel overwhelmed when trying to decide which ones to go to. Regina Alonzi and Katie Drake offer some advice before you take the plunge. As another year draws to a close, are you looking at your children in wonder and disbelief at how fast they're growing up? We certainly are. Karyn Horler decided to document a day-in-the-life of her family, so that they could look back, remember and laugh about their life with little ones. She contacted Armands Sprogis of A-Fotografy, and we spoke to her afterwards to find out what spurred her into booking a photography session and about her family's experience. Monkey Barrel Comedy is one of Edinburgh's newest family-friendly eateries. It offers top stand-up comedy by night, but by day it has started to welcome all ages into its café. We asked one of the owners - a dad of two under 5s - how he went about launching this exciting new venue. Want to contibute a listing? Have you spotted an under 5-friendly venue that isn't in our listings? Just fill in our form to add or update a review.